Dear brothers and sisters, greetings in the Name of our Lord Jesus Christ! Advent is the time of the year when we look back to the birth of Jesus Christ and we prepare our hearts for His second coming. It is therefore also a time when we look at various ways to bring Christ to one another. 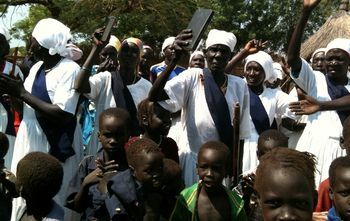 The clergy in Gambella, Ethiopia, are bringing the light of Christ to the people around them, yet the context in which they are serving is overwhelming due to poverty, natural disasters, and tribal conflict. Bishop Grant LeMarquand, the Area Bishop for the Horn of Africa, and I are requesting support for clergy in Gambella. Therefore, this Advent we as a Diocese have decided to commit ourselves to supporting these clergy both prayerfully and financially. While our churches throughout the Diocese will be contributing to this Appeal, it will not be enough to meet the needs of the priests and the 70 churches in Gambella. We invite you individually or as a church or a small group or even as a family, to join us in supporting these clergy, either as a one time gift, or as an ongoing partnership. $2,000 is enough to support 1 clergyman for 1 year. I pray that God will move in your hearts to help these churches.